In these five days thousands of people from all continents participated in an unprecedented event that sought to promote, spread and reflect on this current of grace that is the Charismatic Renewal. If you could not attend part or all of this Event, the following is a summary of the contents in the Logbook. Subscribe to the form below and we will keep you informed of our upcoming activities. We are working to make available soon all the contents of the 1st Ark And Dove Week in a Member Area (PREMIUM), where, in addition to the videos, you can have access to other materials. Would you like to be informed about this and to recieve other informations? 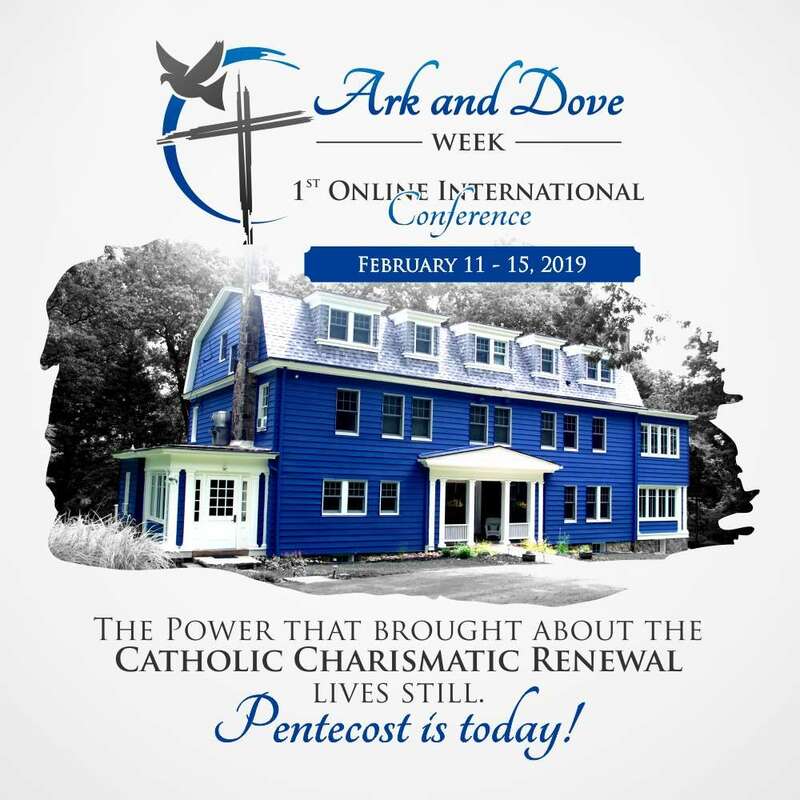 On February 11th, Johnny Bertucci, chairman of The Ark and The Dove Worldwide, opened our Conference sharing the history of the "Retreat House" from its construction to the acquisition in 2015 in the behalf of Catholic Charismatic Renewal. The center, according to the sharing of Johnny Bertucci, wishes to be a place of pilgrimage where anyone who has received the Baptism in the Holy Spirit can feel at home, visiting the center not as a mere guest, but as a member of the family returning to the home. The Ark and The Dove Worldwide aims to foster unity among those baptized in the Holy Spirit at the most diverse levels (within the Catholic Church and among all Christians) as well as share the grace of Baptism in the Holy Spirit with all men. Then our sister Patti Gallagher Mansfield and our brother David Mangan gave an exciting account of Duquesne's Weekend, the initial mark of the Charismatic Renewal in the Catholic Church. Our brother Andrés Arango, a member of the CHARIS International Service of Communion and chairman of CONCCLAT (Catholic Charismatic Latin American Council), shared with us, in the light of his book "Catholic Charismatic Renewal A Current of Grace" (Ave Maria Press), the various necessary levels of attainment for this current of grace, as well as some fruits that one can expect from this Renewal. To conclude the day, our brother Jim Murphy, chairman of the International Catholic Charismatic Renewal Services (ICCRS), made an important sharing of his vision of the new single service to all expressions born of the current of Grace of the Catholic Charismatic Renewal – CHARIS – sharing, in his view, what would favor the process of discernment and implementation of CHARIS in the World. On February 12th, Father Douglas Pinheiro of the Diocese of Osasco in Brazil shared with us about praise and worship in its various dimensions and assemblies (Liturgical, Charismatic, etc.). Likewise, our brother Bob Garrett spoke of praise and worship as a supernatural experience of heavenly realities: Praise and worship make us live here on earth something of that reality described by St. John in the book of Revelation. Our sister Luciana Leone Martinez, of the Renewal in the Holy Spirit of Italy, brought us the foundations and pastoral guidelines for the ministry of praise and worship, with special emphasis on the Charismatic Assembly. Luciana relied on her book on the subject. To end of the day, our brother Martín Valverde shared his experience of more than 38 years ministering praise and worship around the world, with songs like "Gloria" and "Nobody loves you like I do." In fact, Pope Francis, in his speech at the Olympic Stadium in Rome (06/01/2014) reminded us that worship is part of the identity of the current of grace of the Catholic Charismatic Renewal. We hope this day has been a great blessing to you! On February 13th, our brother Salvatore Martinez began the journey talking about the Charismatic Faith, which helps us to "hope against all hope." A certainty is given to us, by the Spirit, of a living, real and confident action of the Risen Jesus in our midst. This faith is the opening door of our hearts for the reception and ministration of the charisms. Next, our sister Mary Healy gave us a most valuable explanation of the charisms as signs that confirm the preaching of the Gospel. For the New Evangelization, Mary Healy told us, we must look to the successful "First Evangelization", analyze its characteristics and basic elements, in order to take them into account in the preaching we do today. Mary explained to us that charisms should be considered within Ecclesiology as part of the charismatic dimension of the Church, rather than being allocated to mystical theology, whose nature differs from the charisms we speak of. One should not be sought, at the risk of losing focus to the Lord himself: The Mystical Experience. The other, however, must, according to the Scriptures, be aspired for the edification of the Body of Christ. Father Darío Bettancourt then placed before us four dimensions, levels or places in which Christ Jesus, the Messiah, acts with his healing grace: First, He frees us from sin, which separates us from grace; then Jesus heals us from spiritual infirmities (hatred, fear, resentment, and complexes); third, Jesus heals of physical infirmities, to manifest his glory, and, lastly, He heals us from the demonic action. At the end of our Journey, Mary Healy shared with us some wonderful testimonies regarding what Jesus is doing in our day, through the Ministry of Healing and Liberation. We hope this day has been a great blessing for you! On this Thursday, February 14th, we began the day dedicated to prayer with the teaching given by Fr. José Eduardo, of the Diocese of Osasco, Brazil, who made an important contribution on how to walk in the Spirit, entering into the mystery dimension and , from "this place", to pray in the Spirit. Following this, our brother Cyril John of India, a member of the CHARIS International Service of Communion, made an important sharing on Intercessory and Prophetic Prayer: When is the spirit itself that reveals to our spirit when, where, by whom to pray in that exact moment, in the certainty that prayer, in some way, "releases" the arm of God so that He can act. After this important sharing, our sister Kátia Roldi Zavaris, Chairwoman of the National Service Committee of the Catholic Charismatic Renewal of Brazil, Vice-Chairwoman of CONCCLAT and member of the Advisory Council of The Ark and The Dove Worldwide, presented the prayer as an expression of someone who , baptized in the Holy Spirit, lives in newness of life and needs this loving contact with the Lord as the earth needs rain. Kátia placed special emphasis on three remarkable forms of prayer: Praise, prayer in Tongues and Listening. To conclude our journey, Sister Mary Gianna of the Congregation of the Disciples of the Lord Jesus Christ, who carries out her apostolate right here at The Ark and The Dove Center, has given us the moving testimony of her conversion after having received a great deliverance: She was one of the students who escaped the "Columbine Shooting" in 1999. In Christ, she found meaning, purpose, love, and fulfillment. Today, dedicated to prayer, Sister Mary Gianna is one of the sisters who takes charge of receiving, with a smile that only someone baptized in the Holy Spirit is capable of, to all who visit The Ark and The Dove. This Friday, February 15th, our brother José Prado Flores, founder of the Saint Andrew Evangelization School and member of the CHARIS International Council of Communion, shared about one of the main fruits of Baptism in the Holy Spirit: Passion for the Scriptures! With his personal testimony, Pepe Prado encouraged us to read our Bibles, carry them with us and through the Bible, discover that the Word of God has a profile, has a name: Jesus! Our brother Ralph Martin, chairman of Renewal Ministries and one of the great pioneers of the Catholic Charismatic Renewal, exhorted us to remain confident in the inerrancy of Sacred Scriptures and the incomparable excellence of the revelation that we received through them. Ralph urged us to read the Scriptures from the Church, especially on two issues of great confusion: Soteriology (all that concerns our salvation) and the Moral Doctrine (with special emphasis on Sexual Morality, so attacked in our days). Finally, Ralph exhorted us not to adulterate the preaching of the Gospel to the delight of the carnals and asked for coherence between what is preached and what is lived. Following this, our dear Fr. Raniero Cantalamessa, OFMcap, Preacher of the Pontifical Household and Ecclesiastical Advisor to the International Service of Communion of CHARIS, offered us his personal testimony of "second conversion" when he was baptized in the Holy Spirit here in the United States and as soon after, he experienced the call to abandon everything and dedicate himself to the itinerant ministry of preaching the Word of God, which was confirmed by the call made to him to be the Preacher of the Pontifical House. Finally, we had the joy of sharing with our brothers and sisters one of the moments that will remain forever marked on the pages of the history of the Catholic Charismatic Renewal: on February 18th, 2017, exactly 50 years later, Patti Gallagher Mansfield recounted the events that took place in that same chapel and which were constituted as the great starting point of the Catholic Charismatic Renewal around the world.